The ancient Greek philosopher Hippocrates II once said that the way to health is to have an aromatic bath and a scented massage every day. It was based on this idea that the concept of visiting a spa was introduced. It’s believed that back in the olden days, spa visits were restricted to males, as the Romans sat and discussed politics and business matters there. Over time, spas and beauty clinics began to offer services that catered more to women. Nowadays, the idea that men who get a manicure or a facial are somehow more feminine has been debunked. In fact, there’s a growing number of spas and beauty treatments that are specially designed for men. Here are some of the more popular and exotic treatments available for all the guys out there! To experience the ultimate relaxation, you must try out the La Prairie signature facials for men. One of the high-end skincare brands, La Prairie dates back to when the popular La Prairie Clinic in Montreux, Switzerland was established. Apart from introducing two luxurious skincare lines – the skin Caviar collection and Swiss Cellular De-Agers, the brand is known for their magnificent spas that offer top-notch services. The moment you step in to one of their spas, you’re transported to a whole new world. Their Gentlemen’s Facial is one of the best treatments available for men. This high priced cleansing and purifying facial is designed to address the unique skin care needs of men. It targets specific problems such as clogged pores, dull skin, dry patches, sensitivity, and irritation due to shaving. The Gentlemen’s Facial lasts for 60 or 90 minutes, and consists of cleansing, exfoliation, facial pore minimisation, and a face pack. It is designed and performed by a team of expert aestheticians only after thoroughly studying the individual’s needs. This facial is done using all of the brand’s top products which help maintain healthy skin. While the 60-minute facial costs around $210, the 90-minute facial will set you back around $270. Along with this treatment, you’ll get to enjoy a cocktail of La Prairie’s ultra-luxurious products, made especially for your skin. Tailored to pamper, this popular 80-minute Age Rebel Facial prevents the signs of ageing in men such as fine lines and wrinkles. It also targets dark circles around the eyes while rejuvenating your skin. It begins with steaming and cleansing the face, after which an enzyme peel is applied. This is followed by a deep facial massage and ends with the application of a toning mask. In terms of the benefits of this treatment, the enzyme peel removes dead skin cells and enhances cell growth. Meanwhile, one of the ingredients used in this effective facial, the antioxidant-rich sea funnel, helps protect against environmental damage. The black oat, golden seaweed, and velvet horn seaweed used during the procedure moisturises and maintains the skin’s hydration. Apart from these ingredients, two major elements used in this facial are acai and chitin. Chitin acts as a removal agent for dead skin cells, while acai is an essential boosting agent for skin vitality, as it contains powerful antioxidants. 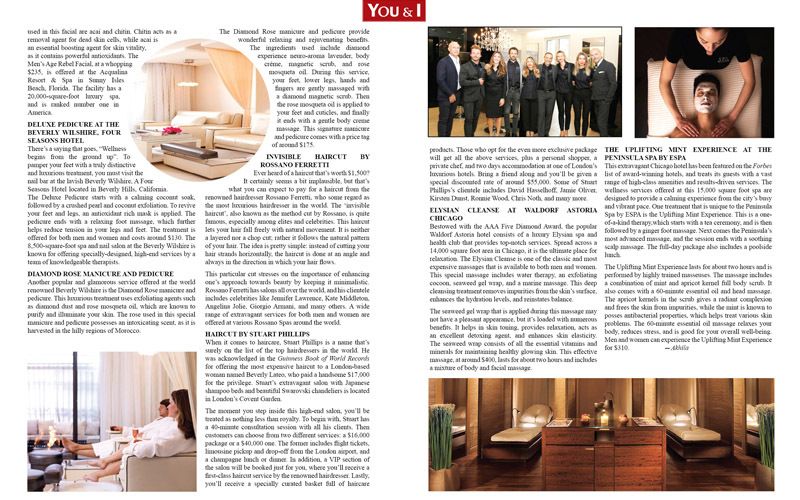 The Men’s Age Rebel Facial, at a whopping $235, is offered at the Acqualina Resort & Spa in Sunny Isles Beach, Florida. The facility has a 20,000-square-foot luxury spa, and is ranked number one in America. There’s a saying that goes, “Wellness begins from the ground up”. To pamper your feet with a truly distinctive and luxurious treatment, you must visit the nail bar at the lavish Beverly Wilshire, A Four Seasons Hotel located in Beverly Hills, California. The Deluxe Pedicure starts with a calming coconut soak, followed by a crushed pearl and coconut exfoliation. To revive your feet and legs, an antioxidant rich mask is applied. The pedicure ends with a relaxing foot massage, which further helps reduce tension in your legs and feet. The treatment is offered for both men and women and costs around $130. The 8,500-square-foot spa and nail salon at the Beverly Wilshire is known for offering specially-designed, high-end services by a team of knowledgeable therapists. Another popular and glamorous service offered at the world renowned Beverly Wilshire is the Diamond Rose manicure and pedicure. This luxurious treatment uses exfoliating agents such as diamond dust and rose mosqueta oil, which are known to purify and illuminate your skin. The rose used in this special manicure and pedicure possesses an intoxicating scent, as it is harvested in the hilly regions of Morocco. The Diamond Rose manicure and pedicure provide wonderful relaxing and rejuvenating benefits. The ingredients used include diamond experience neuro-aroma lavender, body créme, magnetic scrub, and rose mosqueta oil. During this service, your feet, lower legs, hands and fingers are gently massaged with a diamond magnetic scrub. Then the rose mosqueta oil is applied to your feet and cuticles, and finally it ends with a gentle body creme massage. This signature manicure and pedicure comes with a price tag of around $175. This particular cut stresses on the importance of enhancing one’s approach towards beauty by keeping it minimalistic. Rossano Ferretti has salons all over the world, and his clientele includes celebrities like Jennifer Lawrence, Kate Middleton, Angelina Jolie, Giorgio Armani, and many others. A wide range of extravagant services for both men and women are offered at various Rossano Spas around the world. When it comes to haircare, Stuart Phillips is a name that’s surely on the list of the top hairdressers in the world. He was acknowledged in the Guinness Book of World Records for offering the most expensive haircut to a London-based woman named Beverly Lateo, who paid a handsome $17,000 for the privilege. Stuart’s extravagant salon with Japanese shampoo beds and beautiful Swarovski chandeliers is located in London’s Covent Garden. The moment you step inside this high-end salon, you’ll be treated as nothing less than royalty. To begin with, Stuart has a 40-minute consultation session with all his clients. Then customers can choose from two different services: a $16,000 package or a $40,000 one. The former includes flight tickets, limousine pickup and drop-off from the London airport, and a champagne lunch or dinner. In addition, a VIP section of the salon will be booked just for you, where you’ll receive a first-class haircut service by the renowned hairdresser. Lastly, you’ll receive a specially curated basket full of haircare products. Those who opt for the even more exclusive package will get all the above services, plus a personal shopper, a private chef, and two days accommodation at one of London’s luxurious hotels. Bring a friend along and you’ll be given a special discounted rate of around $55,000. Some of Stuart Phillips’s clientele includes David Hasselhoff, Jamie Oliver, Kirsten Dunst, Ronnie Wood, Chris Noth, and many more. Bestowed with the AAA Five Diamond Award, the popular Waldorf Astoria hotel consists of a luxury Elysian spa and health club that provides top-notch services. Spread across a 14,000 square foot area in Chicago, it is the ultimate place for relaxation. The Elysian Cleanse is one of the classic and most expensive massages that is available to both men and women. This special massage includes water therapy, an exfoliating cocoon, seaweed gel wrap, and a marine massage. This deep cleansing treatment removes impurities from the skin’s surface, enhances the hydration levels, and reinstates balance. The seaweed gel wrap that is applied during this massage may not have a pleasant appearance, but it’s loaded with numerous benefits. It helps in skin toning, provides relaxation, acts as an excellent detoxing agent, and enhances skin elasticity. The seaweed wrap consists of all the essential vitamins and minerals for maintaining healthy glowing skin. This effective massage, at around $400, lasts for about two hours and includes a mixture of body and facial massage. This extravagant Chicago hotel has been featured on the Forbes list of award-winning hotels, and treats its guests with a vast range of high-class amenities and results-driven services. The wellness services offered at this 15,000 square foot spa are designed to provide a calming experience from the city’s busy and vibrant pace. One treatment that is unique to the Peninsula Spa by ESPA is the Uplifting Mint Experience. This is a one-of-a-kind therapy,which starts with a tea ceremony, and is then followed by a ginger foot massage. Next comes the Peninsula’s most advanced massage, and the session ends with a soothing scalp massage. The full-day package also includes a poolside lunch. The Uplifting Mint Experience lasts for about two hours and is performed by highly trained masseuses. The massage includes a combination of mint and apricot kernel full body scrub. It also comes with a 60-minute essential oil and head massage. The apricot kernels in the scrub gives a radiant complexion and frees the skin from impurities, while the mint is known to posses antibacterial properties, which helps treat various skin problems. The 60-minute essential oil massage relaxes your body, reduces stress, and is good for your overall well-being. Men and women can experience the Uplifting Mint Experience for $310.